Zoya has released a new summer collection, Ultra Brites Safe Neons, full of intense, cream-finish neon shades. We are thrilled to share with you 6 new shades for Summer: Ultra Brites! Not only are these glowing shades the perfect way to brighten up your summer, but they are also safe! Our formula uses the latest environmentally and cosmetically approved pigments in a highly stable formula. This means you get all of the BRIGHT with none of the industrial yuck and commonly associated with colors of this kind (and banned worldwide). 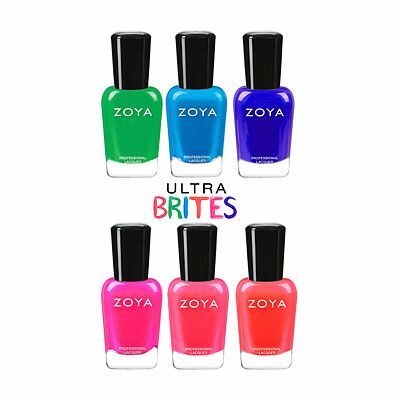 The code NEON gets you free shipping plus two bonuses—full sizes of Zoya Purity & Naked Manicure Glossy Seal—when you order the Ultra Brites Neon Intro Sampler (US$40 for full sizes of all six shades). The offer runs now throgh July 12, 2016. Unfortunately, this deal is valid in the continental US only. Zoya Professional Lacquer retails for US$10 and is 0.5 US fl oz / 15 mL. Zoya nail polishes are free of toluene, formaldehyde, dibutyl phthalate (DBP) and camphor, and are made in the USA. Zoya is part of Art of Beauty, a privately held company based in Cleveland, OH, USA. the top 3 shades are stunning! 413,070 times by nail polish fans!